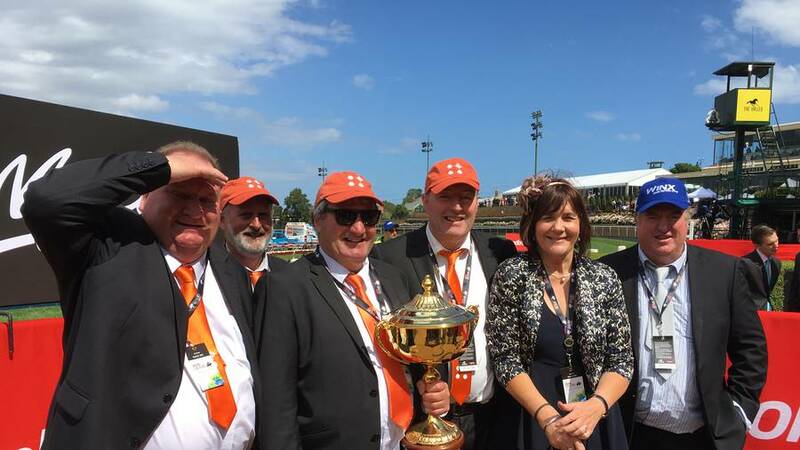 The O'Learys (centre) Shaun, Humphrey and Fiona show off the Moonee Valley Cup flanked by good mates Stephen Gudsell (left), Colin Gibson and Guy Lennox. It has been a long, yet productive two years between drinks for the aptly-named Whanganui veteran galloper Who Shot Thebarman. The ageing stayer has earned his shot at history with his Gr.2 Moonee Valley Gold Cup (2500m) victory on Saturday. A nine-year-old, the New Zealand-bred and owned son of Yamanin Vital will now be given the opportunity to become the oldest winner of the Gr.1 Melbourne Cup (3200m) at his fourth consecutive start in the time-honoured race that stops two nations. "You'll see him on the first Tuesday of November," expat trainer Chris Waller said. "He's been in the race three times. The first time he ran third, the second time he was knocked over and almost fell (11th). The third time he ran fifth." Who Shot Thebarman is raced by brothers Dan, Humphrey, Michael and Shaun O'Leary and their wives, who are from the Whanganui and Rangitikei districts. The last time Who Shot Thebarman won was on November 14, 2015 10 days after running 11th in the Melbourne Cup of that year. He won the Gr.2 Sandown Classic by seven lengths. However, that has not stopped the Yaminin Vital gelding earning money for the O'Leary clan. To date he was won just a tick over $3 million and almost $2 million of that has come from running places at elite level in Australia. "It's been a long time between winning drinks, but he's done us proud along the way," Humphrey O'Leary said. He and Shaun were the only brothers on hand at Moonee Valley to witness victory on Saturday, although a large contingent of close mates from Whanganui and Waverley were in the travelling party. It was a record crowd at on a record-breaking Moonee Valley race meeting. Winx, of course, was the major attraction going for her third win in the Gr.1 Cox Plate and she duly obliged. "We had a big following too as we always do in Australia," O'Leary said. "They really cheered and appreciated seeing him, a nine-year-old, winning another race. Chris said before the race he wanted Blake Shinn (jockey) to settle into a nice rhythm, let him go through his gears and run home strongly. That's exactly what happened and it was good enough to win beating stablemate and fellow Melbourne Cup hope Libran. "He came through the race very well and was taken to the beach the next morning for a paddle. Blake text us on Sunday to say he had elected to ride Humidor in the cup and thanked us for our loyalty in sticking with him lately. You can hardly blame him, because Humidor is a serious chance and Cup favourite after running second to Winx. The two mile (3200m) of the Cup will suit Who Shot Thebarman even better than the 2400m of the Moonee Valley Cup with the stock of Yaminin Vital out-and-out stayers. "We text backed to thank him and wished him all the best saying we would be chasing hard next Tuesday. We understand Chris has been talking to Tommy Berry, so tentatively it looks like we might have him." Berry is one of the top riders in Hong Kong. In the meantime, the entire O'Leary clan, including wives, relatives and close mates are all packing their bags to be on hand at Flemington on Tuesday for Who Shot Thebarman's fourth and possible final attempt to crack the big one.